Brock Lesnar and Paul Heyman head to the ring. Hey tells everyone that Bray Wyatt’s plan to remove Lesnar from the title picture failed and that Lesnar, at his leisure, will enforce the 11th commandment: though shalt not intentionally provoke Brock Lesnar. Heyman goes on to say that Lesnar will imprison Reigns and Ambrose in Suplex City at Fastlane and will go on to beat Triple H at Wrestlemania. He says that Reigns understands what it’s like to face Lesnar, but Ambrose needs it explained to him. Because he rode the short bus to school. Ambrose heads to the ring. 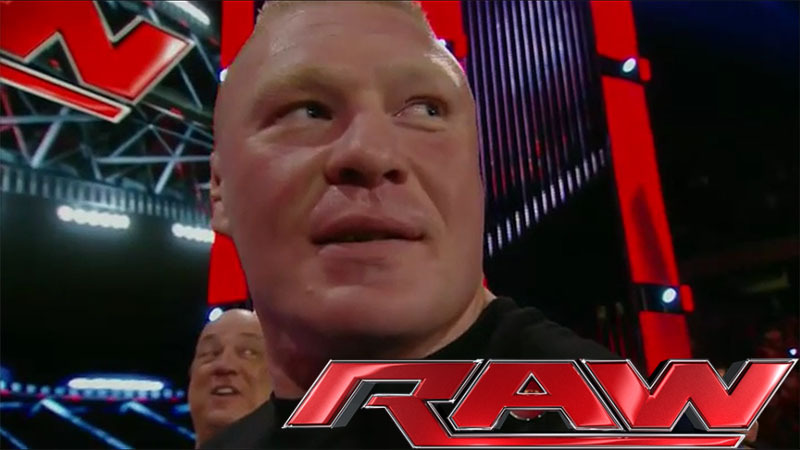 Lesnar laughs in Ambrose’s face. Ambrose calls Heyman “Porky.” He tells Lesnar that he may look crazy, but he’s not. And he’s not stupid. He respects Lesnar and wants to tell him to his face that he wants the title and is willing to fight for it. Ambrose calls himself the iron man of the WWE. Lesnar laughs. Ambrose leaves. Pretty good match. As in most Kalisto matches, Kalisto was the underdog and took a lot of punishment. There were some nice moves where Rusev got to show his strength (such as catching Kalisto as he dove from the top of the post to the floor). You could kind of see the ending coming well before it hapened, but it was still good. It made a lot of sense for the upcoming match with Del Rio too. Stephanie McMahon talks with Reigns and Ambrose about friends betraying friends. Absolute power corrupts, absolutely. She calls Ambrose Reigns’ sidekick. Reigns and Ambrose says what she’s doing isn’t going to work. Stephanie sets up a match for tonight versus New Day. Renee Young asks Brie Bella how Nikki is doing after her surgery. She says she’s doing great. Charlotte interrupts and asks Brie to give Nikki her sympathies. Charlotte wonders if Nikki’s injury is her fault. She doesn’t apologize for it. The Usos head to the ring for their match. According to Lilian’s ring announcing, the Usos have won a Grammy. After a commercial break the commentators replay the call and make fun of her. The Social Outcasts then talk about how they are the closest bunch of brothers in the WWE. They then wonder where Bo Dallas is. Apparently they forgot that he wouldn’t be there this week because he’s recording a rap album. An okay match. The Usos dominated by keeping Jey isolated (with a long time in multiple chinlcoks), then the Usos threw a lot of kicks to come back. This one could have been a lot more exciting. The Miz is in the ring and introduces Miz TV. As usual, he pauses for the crowd to say the name of the show and about five people actually say it. He goes on to say that AJ Styles has a phenomenal story. AJ comes out. Miz asks AJ who AJ Styles is, but he doesn’t really let AJ talk. Miz tells AJ’s story for him. He rambles on and on. Miz says AJ reminds him of Daniel Bryan, pointing out that Bryan didn’t do anything until Miz became his mentor. He calls himself the “father of the yes movement.” The crowd disagrees. Regardless, he tells AJ that he wants to mentor him. Before AJ can answer, The Miz gets mad at the crowd and insults AJ. He says AJ will fail if he listens to the WWE Universe. He calls AJ a “rookie redneck.” AJ attacks. Miz runs away. WWE celebreates Black History Month with an Aretha Franklin quote. Pretty good match. Brie was in control early. She was fighting angry though, and that allowed Charlotte to dump her out of the ring. Charlotte then took advantage for a good portion of the match. Flair sort of got involved in the match. His involvement led to the finish which is fine, but his reasons for being where he was for as long as he was were a little unclear, so that was a little distracting. Not a great match. Really short and completely one-sided. I see where they’re going with this, but that doesn’t mean this particular match was fun to watch. After the match Strowman and Harper get in the ring and help Rowan attack Big Show. They drag Big Show out of the ring and slam him on the ring steps. Pretty good match. Titus was all power. Breeze did what he could and tried to take advantage in unique ways, but Titus showed impressive strength, maybe even a little more so than usual. Not bad. Triple H wonders if things are getting soft in suplex city. Lesnar says Triple H will find out at Wrestlemania. Really good match. Owens seemed particularly viscous and talkative. Ziggler got beat up a lot but hung in there, and that made me really pull for Ziggler. More than usual. Part of it was Owens delivering some rough looking moves, and part of it was Ziggler’s propensity for selling things very hard. It really made this match stand out for both of them. It felt important. Sasha Banks gets on the mic in the ring and says she’s back, but now it’s on her terms. She’s on her own now. She issues a warning to Charlotte. Naomi and Tamina come out. They (seemingly sarcastically) say they are proud of Sasha. Naomi says they knew this time was coming and there are no hard feelings. She says they can be competitors and sisters at the same time. Sasha asks if they’ll have her back in her match against Becky Lynch. She wants unity and the three of them seem to be on the same page. A very good match with an predictable ending. The match was really more for story than the in-ring action, but the in-ring action was good. Sasha had some nice, unique moves and actions in the ring like catching herself while running the ropes causing Becky to become vulnerable when she dropped down as usual. After the match Naomi and Tamina continue to attack Sasha. Becky helps Sasha fight them off. A sneak peek of JBL interviewing Ron Simmons on Legends with JBL. Renee Young asks Chris Jericho about AJ Styles. He’s been thinking about AJ all week. He’s very, very curious about the outcome of Styles versus Miz on Smackdown. R-Truth encounters Goldust in the bathroom. R-Truth says he doesn’t want to tag with Goldust because he’s a weirdo with doo doo on his foot. Goldust points out that R-Truth’s last partner was imaginary. R-Truth says Goldust’s words cut deep, down to the white meat. He leaves. Goldust is sad. New Day is tired of hearing about the remarks made by The People’s Booty, The Rock. They shamed The Rock last week, and they shame him again this week. They ask him to think about the children. Kofi points out a kid who is shaking his hips. He tells the kid that they will still fight him, but they will fight him out of love. Tonight, they will beat up Ambreigns. Good match. Usually in matches like this Ambrose would be isolated for the majority of the match and Reigns would come in every once in a while and at the end to clean up. In this match they really shared duties in the ring so they felt more on equal ground. That’s a good thing since they’ll be facing each other at Fastlane. Other than that, this was a pretty typical, and good, New Day tag match. After the match Brock Lesnar heads to the ring. He hits an F5 on Ambrose as Reigns is taken out by New Day. Not a bad show. It set up a number of interesting developments in the various stories, and while the first few matches weren’t spectacular, the last three matches made up for it. This was really good and exciting. It felt like the most important match of the might, not because of any storyline, but because of the work done in the ring.